As you can see from the fishing photos, our guests enjoy one of the top trout fisheries in Utah and perhaps one of the best lake fisheries in the West. We pride ourselves on managing the fisheries to provide the best habitat possible for trout numbers and growth. The lakes are home to several trout species and varieties including Rainbow, Brown, Brook, and Tiger trout. 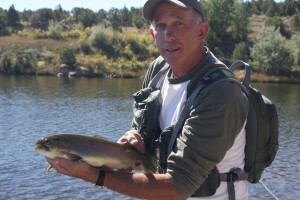 Our private lakes are popular with Utah fly fishers looking to land a real trophy on a fly rod. Whether you are just learning to fish, are an expert angler, or are somewhere in between, you’ll find fishing at Six Lakes to be an experience of a lifetime.